Driving alone can get boring and lonely, and if you’re trying to find your way in a new place it can sometimes get dangerous. 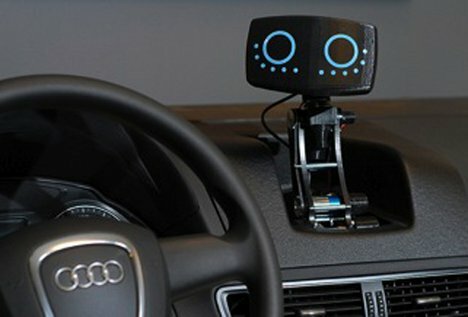 The AIDA (Affectionate, Intelligent Driving Agent) robot developed by Volkswagen and MIT is designed to be an in-car buddy to not only help you find your way, but to keep you company on the road. Unlike normal GPS units which are dull and kind of annoying, AIDA is meant to be friendly. The more you drive with AIDA, the more the robot learns about your driving habits and adapts its communication to you. The friendly little bot can recognize faces and emotions through the video camera in its “face,” which displays a pair of huge eyes. The project is an advancement of the relationship between driver and car. According to the folks behind AIDA, it is an exploration of the social aspect of driving. The prototype is only a robot head mounted on a stand-alone car dash right now, but the researchers plan to install AIDA into a functional test vehicle in the future. See more in Cars & Trucks or under Transportation. November, 2012.